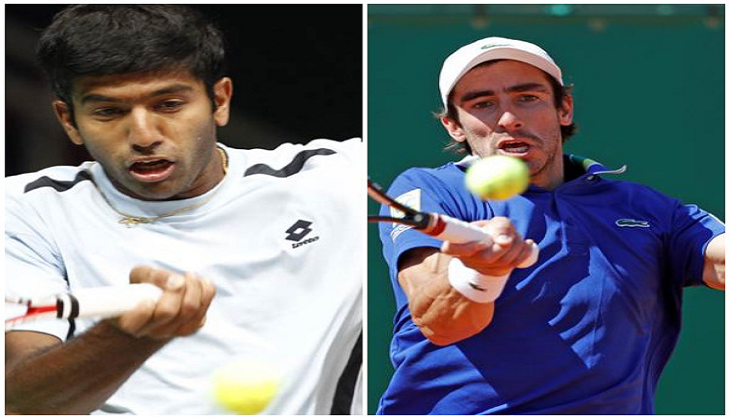 Indian tennis ace Rohan Bopanna and his Uruguayan partner Pablo Cuevas were knocked out of the Madrid Masters after being crushed in straight sets in the opening round of the men's double event here last evening. being crushed in straight sets in the opening round of the men's double event here last evening. The unseeded Indo-Uruguayan pair lost 3-6, 2-6 to French-Canadian team of Fabrice Martin and Daniel Nestor in a one-sided first-round contest. Bopanna and Cuevas were also stunned in the first round of the Barcelona Open last month after they went down against the tournament's top-seeded pair of Henri Kontinen and John Peers. Bopanna is now ranked 18 in the world while Cuevas is ranked 24 in the doubles and 26 in the singles. Prior to that, Bopanna and Cuevas defeated the Spanish pair of Feliciano Lopez and Marc Lopez 6-3, 3-6, 10-4 to clinch the Monte Carlo title.